Don Bigsby is in Sochi for the 2014 Winter Olympics. Bob Boehm isn’t there, a last-minute scratch. For both men, though, the Games mean more than athletic feats to cheer and medal counts to track. 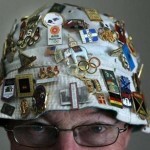 Their arrival means a new batch of Olympic pins are in circulation, a biennial bonanza to hobbyists like Bigsby and Boehm, whose personal pin collections run well into the thousands. “It gets to be a real frenzy, the number of people trading pins” at an Olympic site, said Bigsby, 73, a retired telephone company engineer from upstate New York, as he prepared to leave for Russia. Bigsby cofounded Olympin, a collectors’ club with 550 members in 32 countries, and expects to spend much of his time in Sochi in pursuit of Olympic loot. Boehm, a retired Lowell schoolteacher, had planned to be in Russia, too. A veteran of 13 Olympics, he canceled his trip in mid-January due to a family issue. However, he’s already scooped up a fistful of Sochi pins handed out at a traveling Olympics exhibit in Boston, adding to the 5,000 pins he already owns. Please click here to enjoy Bob’s entire story.